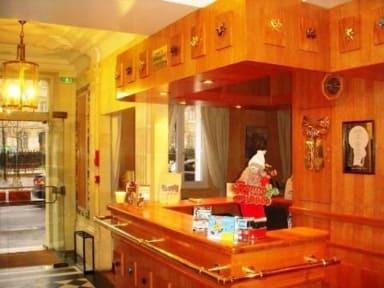 Hotel du Square d'Anvers i Paris, Frankrike : Boka nu! Located next to a peaceful square and just 100 metres from Anvers Metro Station, this 2-star hotel offers a free Wi-Fi connection. It is 300 metres from the Sacré Coeur and Gare du Nord is a 10-minute walk away. Rooms at Hôtel du Square d'Anvers are decorated in warm tones and feature a work desk. All rooms have a modern, private bathroom and some have an LCD TV with satellite channels. A buffet breakfast is served in the breakfast room, which looks onto the summer garden and terrace. Additional facilities at Square d'Anvers include room service and a 24-hour reception with luggage storage. Hotel du Square d'Anvers housed in a 19th century building, features comfortable rooms and public spaces to relax in a cozy and calm setting. Guests are also invited to enjoy a drink in the bar of the hotel, open all day long till late at night. 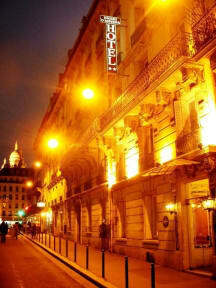 The Moulin Rouge and the famous Amelie’s Café are a 10-minute walk from the hotel. Other attractions including the Arc de Triomphe and Nation Square can be accessed directly using public transport.